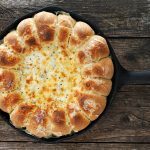 This Warm Skillet Bread and Artichoke Dip is perfect for entertaining! 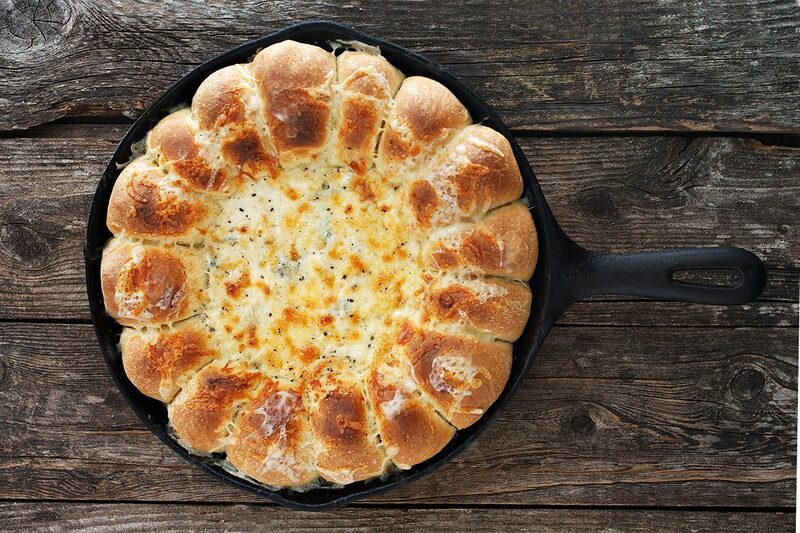 With the bread and the dip all in one skillet, it’s great for feeding a crowd. I have always thought of the holiday season as a once-a-year excuse for indulgence, decadence and excess (cheese :). 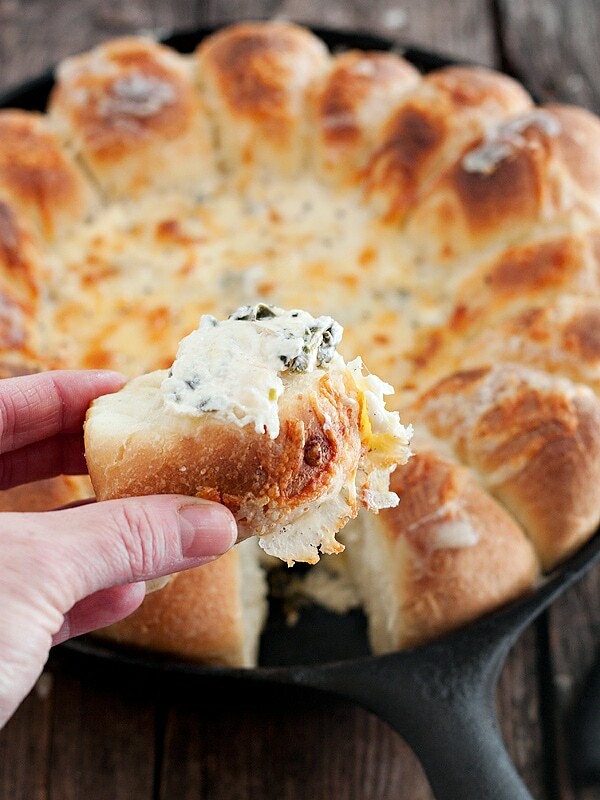 And in that spirit, I humbly offer up this skillet of warm cheese-topped bread and creamy, cheesy artichoke spinach dip. And you can make this skillet of goodness with a loaf of frozen, pre-made bread or roll dough (thawed) or make your own dough with the recipe below. Whether it’s to accompany a football game or a holiday gathering, you’ll be the hit of the party when you bring this one out! 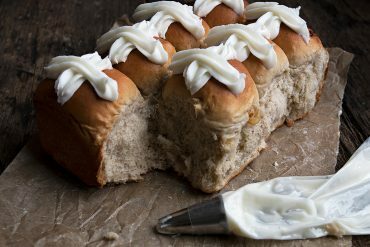 Fresh, warm pull-apart buns ring the outside, while the centre is filled with warm artichoke and spinach dip. Simply grab a bun and spoon a bit of the warm dip on top. As everyone knows, I like nothing more than to whip up my own bread dough, but don’t feel you need to do likewise (although this bread is wonderfully soft on the inside and crispy on the outside). 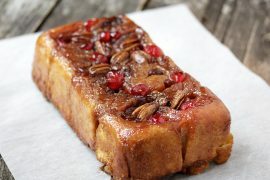 Instead, you can easily use a loaf of frozen pre-made bread or roll dough (thawed). Just follow the directions below. While best fresh from the oven, I have made this ahead and re-heated to serve. Simply bake, cool a bit then refrigerate covered with foil. To serve, cover loosely with tinfoil and pop into a 350° F. oven for 25-30 minutes to re-warm. It’s also worth noting that you can use any of your favourite baked dips in this dish (I think it would be great with a warm crab dip! ), so get creative and make your own version. 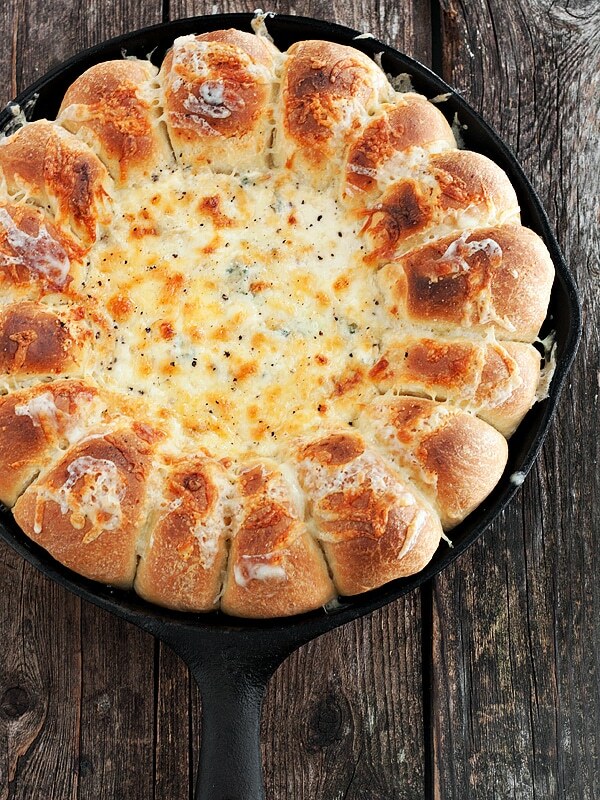 Don’t have a cast-iron skillet yet to make this Warm Skillet Bread and Artichoke Dip? Be sure to allow dish (and skillet!) to cool from hot to warm before serving. You can always wrap the handle in a tea towel, just to be safe. My skillet is 8-inches diameter on the bottom, 10-inches across the top. Perfect for game day or family get-togethers, this dish is warm, creamy and cheesy. Adapt it by using any baked dip in the center. Do watch the hot skillet and wrap the handle, if necessary. Add two cups of the flour to a large bowl of the bowl of a stand mixer fitted with a kneading hook. Add salt and combine. Warm milk to lukewarm. Stir in yeast and let stand a few minutes. Add yeast mixture to bowl, along with the vegetable oil or melted butter. Mix and add additional flour in 1/4 cup increments until a smooth dough forms. Knead until smooth. Transfer dough to an oiled bowl. Cover with plastic wrap and let rise until doubled, about 1 hour. Make Dip: Meanwhile, place fresh spinach in a bowl with 1 Tbsp. of water. Cover tightly with plastic wrap and microwave on high for 1 minute. Remove from microwave, leave covered and let stand 15 minutes to cool. Drain spinach well and add to a medium bowl. Add the remaining dip ingredients and mix until well combined. Cover and refrigerate until needed. Cutting/shaping dough: Turn dough out onto a lightly floured cutting board. Using a sharp knife or bench scraper, cut the dough into 16 equal pieces. (I cut in half, then each piece in half, then repeat cutting each piece into equal parts until I have 16 pieces). Shape each piece into a ball by pinching the edges together underneath. Generously butter an 8-inch cast-iron skillet. Find a bowl that is about 5 1/2-inches across the top, spray the outside with cooking spray and place it, top side down, in the center of the skillet. (*If you can't find a bowl, take a sheet of tin foil and shape it into a tight circle about 5 1/2-inches around and 1 inch high and place it in the centre. Spray it with cooking spray. Arrange the dough balls around the outside of the skillet, pushing them together as needed until they all fit. Brush dough balls generously with melted butter. Cover the skillet with plastic wrap and let rise until puffy, about 30 minutes. Pre-heat oven to 375° with rack in center of oven. Remove bowl from center of skillet. Spoon prepared dip into the center space, pushing it right up to the edge of the dough. Sprinkle top of dip with additional mozzarella/Parmesan. Bake in the pre-heated oven for about 30 minutes, until rolls are golden and sound hollow when tapped and the dip is bubbly. Remove from oven. Raise oven rack to the top third and switch oven to broil. Sprinkle the rolls with additional mozzarella cheese and return skillet to oven under the broiler, until the cheese and dip is browned. Let skillet stand at least 5-10 minutes, or until just warm (not hot). Add a bit of freshly ground pepper on top, if you like. Do watch the hot skillet handle and wrap in a towel if it is still to hot to hold. Serve with a dip "knife" and let everyone serve themselves. I tried this as a new recipe, never made before by me, which I usally don’t do for company. It was the perfect appetizer bread combo that I look for, combined both bread and appetize and I got rave reviews! Thank you so much. So glad you enjoyed it, Lynn :) Thanks! I accidentally submitted my comment rather than clicking my rating. This was amazing! A very simple recipe that results in something that looks incredibly difficult to make and tastes amazing! I made this the other day and it turned out incredibly well. I was nervous about the bread-making but it turned out to be so simple and it was perfect! I will most definitely be making this again soon! Thank you! Just to be clear…with your hands, you take the 16 pieces of dough and just make them into balls and put them side by side in the skillet, right? The “pinching the edges underneath” is throwing me off, sorry. Hi Judy, It works fine for me and I haven’t had anyone else report an issue. Are you trying to print from the actual web page (in browser?). Have you tried the “Print Recipe” link at the top (right under the large top photo)? Has anyone tried this when in a hurry using a pan of Sister Shubert (or similar brand) frozen rolls, by removing the center rolls, leaving on the ring of rolls around the edge of the pan, and adding the dip in the center? 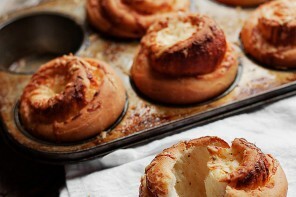 You could either save the center rolls for another meal, or bake them separately to serve alongside the pan of rolls/dip. Hi Mike. I think this would totally work for a quick presentation. I would cook the dip separately. Arrange rolls into skillet (around outside) and spoon cooked dip into middle. Top everything with a bit more of Parmesan or shredded mozzarella and heat in a 350° F. oven for 10 minutes or so (just to warm rolls, really). I found out about this recipe a long time ago, but never thanked you for it. I made it already so many times and it has always been a seccess. It was an appetizer for our New Years Eve dinner this year (or should I say last year) and again everybody loved it. Ditto on that! I made two times before then lost recipe.. found it again today! And yes, thank you!! If you use the frozen dough balls do you cut them in half and how many would you use for skillet? Hi Sue, I have to be honest. I’ve never made this with frozen dough balls, so I’m not sure how big they are. My skillet of 8-inches, held 16 rolls which were a nice size. So you could judge by that (if you can only fit 8-10 around the edge of a skillet, I’d cut them in half). Enjoy! if I were to make this ahead of time, then thaw it out, what temperature would you suggest reheating it at? Hi Jenne, I would cover with foil and reheat at 350 degrees F. until warm. We just made this and it is WONDERFUL! We are adding it to our date night appetizer favorites. 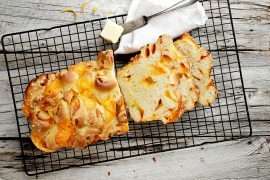 Warm, cheesy, bread, delicious!!! Thank you. Sounds amazing. I’m making freezer meals for a friend who is going through chemo. Any ideas how this might work? Assemble up to the pint of putting in the oven, then freeze? 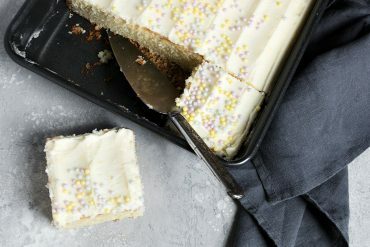 Defrost before baking? Gosh Martha, I’m struggling with this one given the bread and the dip to consider. I might be tempted to bake it off then freeze. To serve, simply thaw and re-heat covered with foil in the oven. Has anyone made this without it being a skillet? 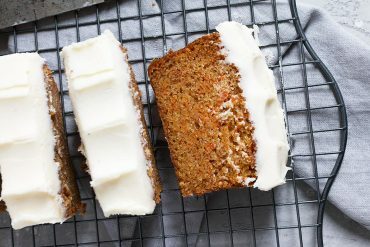 A friend of mine does not have one, but she’s bringing this recipe to our upcoming Superbowl party (per my recommendation!). Has anyone tried to make this in a circled baking dish or a deep tin dish (disposable?). Just made this today. The bread and spread came out fine. I skipped the spinach though as I didn’t have it on hand. I thought it was great to have both in one skillet. I did add more parmesan and used mozzarella balls cut up rather than shredded. I think some chopped jalapeños would add a nice zing. This looks amazing! Would it work with pizza dough? I don’t see why not (that or pre-made bread dough). I think as long as you do the boiling/salting step, they’d be fine. Thank you, I am not seeing the boiling and salting steps. Sorry. I was thinking about my skillet recipe that I just posted, so it was top of mind. No boiling needed for these rolls. Yummo! This looks soo good! Thank you for sharing your recipe! 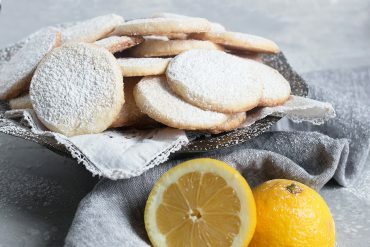 I’m not a frequent comment-leaver, but I just wanted to thank you for posting this recipe. I made it last night as a starter, and got rave reviews!! It’s relatively easy to make, and it looks really impressive coming out of the oven. None of my dinner guests could wait till it cooled to dig in! I’m generally a big fan of spinach artichoke dips – this one came out a little on the thicker/stiffer side. Next time I would maybe use a ricotta base instead of cream cheese and sour cream, but that’s just a personal taste thing. Five stars and a fist bump for this recipe!! Hi Angela and so glad you enjoyed it. You’re right. The dip is thick. It’s really intended more as a spread than a dip (assuming people will spoon it onto the bread, rather than dip the bread in it). Ricotta might thin it a bit, if you like, but I’d fear you’d lose some great flavour with it (if you replaced the cream cheese/sour cream). Has anyone tried the can of refrigerated biscuit dough with this? I stockpiled when it was half price..
Hi Aj, I haven’t tried it myself. Maybe someone else might weigh in. Don’t see why it wouldn’t work. Baking times would be different, obviously. Whatever the times are on the dough should work. I have made it twice: once with frozen bread dough and once with Pillsbury French Bread in a can–I cut both in half length ways first and then into small pieces before putting in the cast iron pan.. I preferred it with the frozen bread dough but biscuit dough sounds good to. Let us know how it turns out if you try it. I also tried baking it with a metal bowl holding the center open and added the dip after the bread baked asI felt the dip cooking in the center made the center and bottom of the bread too wet and doughy. The bread turned out crisper that way. I also made it once in a pyrex pie dish and it worked great. Thanks for weighing in, Brandy. I’ve never experienced the bread being doughy when baking with the dip, although my dip never comes too far up the inside edge of the rolls. That might be the difference. I did make this with refrigerated biscuit dough. Although I am sure homemade would have been better (isn’t it always?) it did taste great, and saved me a ton of time! No making a hole with a bowl or waiting for dough to rise, I just cut biscuits in half, rolled into balls, added dip, baked. I did end up baking for longer than the package said, so be sure to keep an eye on it. Thanks for coming back to let me know, AJ. It will be useful for others, for sure and a great way to save some time making this dish. I made it tonight for the championship games and everyone loved it and I have been asked to make two for Superbowl! Wonderful appetizer for game night! if using frozen bread, at what point in the thawing process do you start turn it out and cut it up? Hi Brandy, As soon as it is thawed enough to cut. Cut it into the pieces and hopefully it is also thawed enough to shape into balls, as well (if not, just leave it a few minutes once cut and it will be). Once shaped into balls, place into skillet to rise. I dont have a mixer could I use that simply homemade bread mix ? Sure. I think that would work just fine. I must say that this is just genius. I love it! Must make ASAP. Thank you! Thanks so much Lindz. Happy New Year! I just made this for lunch. Used an oven pan and swopped the artichokes for bacon bits and the mozarella for cheddar. Added a tablespoon of worcestersire sauce and a teaspoon of mustard. Was so yum we literaly licked the pan! Thanks for sharing! So glad you enjoyed it, Lizl. Love your version! So beautiful and creative. 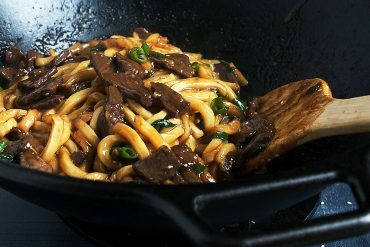 I love recipes using my cast iron pans. So glad to hear you all enjoyed it. Your kids will enjoy their skillets, too! Merry Christmas! I’m making this tonight, but I don’t have cast iron and my crowd says no spinach. I am also using frozen dough. I don’t feel guilty though because I’m making so many things. I’ve got two pans going so I’ll try one first as a test before guests arrive. You had me at the picture!! Fingers crossed!! Hope you enjoyed it, Judy. Merry Christmas! Don’t you need a small amount of sugar to activate the yeast? Hi Nathan, You can add a bit to the milk, if you’d like to be sure your yeast activates, but milk has sugar in it, usually enough to activate yeast. Your bread always looks amazing – and now you put dip in the middle. Genius! Happy holidays Jennifer! Thanks so much, Renee and same to you! Hope you have a wonderful Christmas. Cant wait to make this one for the family…looks wonderful! What a terrific appetizer for the holidays. Your photos are fantastic….it looks like I could just scope up some of that dip right from my computer screen. Thanks so much, Karen. It was delicious! This looks amazing!! I’m planning on making a spinach & artichoke dip for a holiday get together at my house and this might be it!! Could I use a baking dish (white casserole dish) instead of a skillet. I don’t have a skillet! :( lol. No skillet?! I don’t know what I’d do without mine :) But yes, absolutely, a casserole dish would work just fine. Just grease well so your rolls don’t stick, would be my only advice. Enjoy! I ended up getting myself a skillet as a late Christmas present. I am actually seasoning it right now in time for my dinner tomorrow. :) thank you for replying to my comment with an answer to my question so quickly and I can’t wait to make (and eat) this delicious dip!! Happy New Year! You will love your skillet, Bridget. 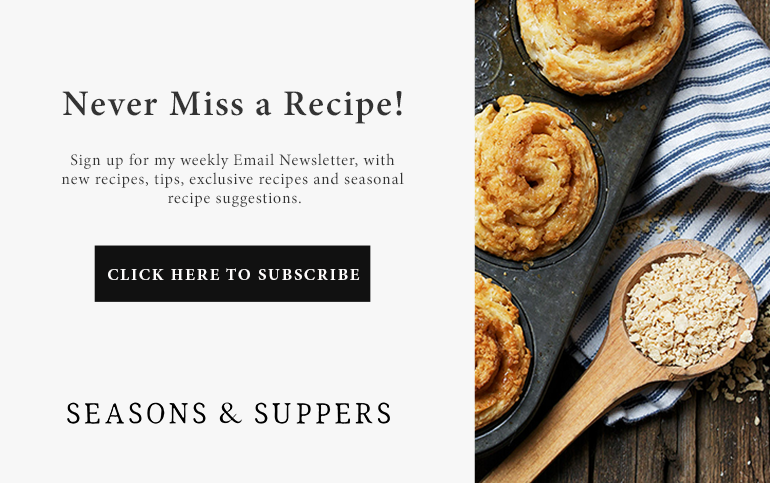 I have a lot of other skillet recipes here and I also have a Pinterest board just for Cast Iron Cooking and Baking, with lots of ideas from other sites! Enjoy! A quick trip to resale/second-hand/thrift store can be an excellent gift to yourself. Remember to season it before using. Search net for instructions for seasoning cast-iron cookware. Oh man – I could easily make dinner out of this! Wow this looks so good. 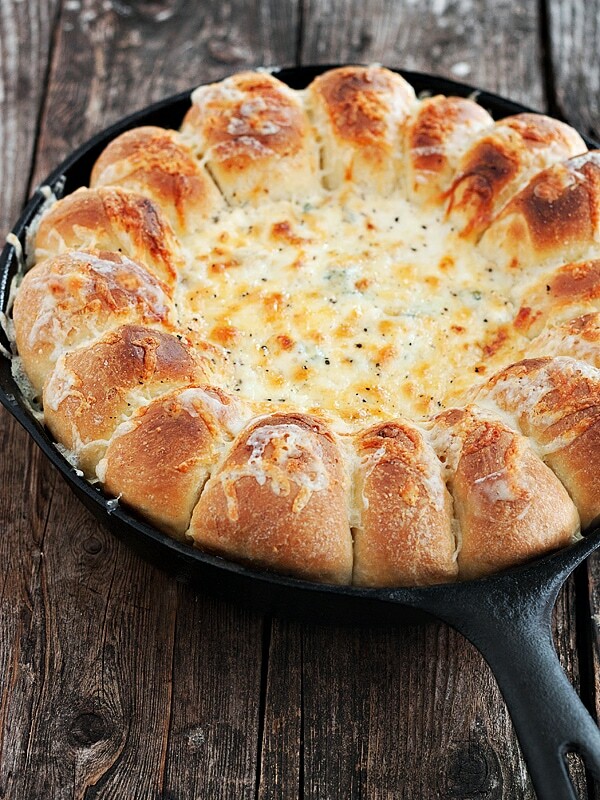 I love the idea of fresh bread and dip in the same pan. Haha yes, I think the towel around the handle is key! Too many times I have nearly grabbed (or really grabbed!) the hot handle of a skillet from the oven… I’m too used to them being fine to touch when on the stove. AHK! Accident-prone. This sounds so good, Jennifer and I love the composition and that it’s all in cast-iron! For Christmas I usually do baked brie (with a layer of minced garlic under the pastry) for when we open gifts, but this year I’d like to try this instead! I think the little ones would love it. Actually…. baked brie could do well in this application… but spinach-artichoke sounds too good! Cheers! I always remember to remind about the handle, because I have done the same thing many, many times, Sophie. I think Brie would do well in this. Maybe do an herb bread instead of cheese? I love spinach artichoke dip! This is such a great holiday appetizer idea! Thanks so much, Laura. We’ve been nibbling on it and enjoying. It keeps in the fridge pretty well! Yes, it would be great with this one!